Cast: Willa Fitzgerald, Bex Taylor-Klaus, John Karna, Carlson Young, Tracy Middendorf, Tom Maden, Amadeus Serafini, Connor Weil, Jason Wiles, Amelia Rose Blaire, Bobby Campo, Brianne Tju, Bella Thorne. There’s a sad irony that the final episode of this show was prefaced by the passing of Wes Craven by a matter of days. Small-screen slasher plots don’t tend to work so well, as Randy-clone Noah points out in the first episode here. Harper’s Island was fun until it got stupid. But it had to get stupid. If slasher movie characters were like the rest of society, they’d do the smart thing, call the cops, and barricade themselves safely out of harm’s way. 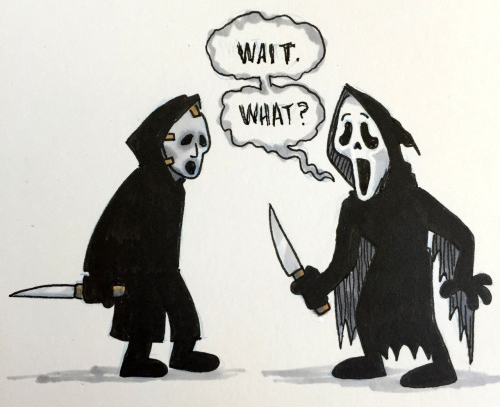 So, with Scream being the self-aware, make-the-joke-about-yourself-before-somebody-else-does class clown of slasher franchises, how does it stretch from 110 minutes to 450? You stick with tradition in the first instance and kill off a hot nubile girl who’s alone at her house. Said hottie is Queen Bee of Lakewood High, Nina Patterson, who just happened to have uploaded footage of her bi-curious classmate Audrey macking with another girl. A few tormenting texts and a decapitated head in the jacuzzi later, and Scream Lite has claimed its first two victims. Cut to Sidney Prescott Emma Duval, our nice-girl heroine and choice plaything of the masked loon, who may or may not have something to do with the requisite 20-years-gone murders that occurred in the town, courtesy of local deformed kid Brandon James. Before the debut episode is up, we’ve learned his teen crush was no other than Emma’s mom Daisy (Middendorf), also the town coroner, and secretly the grown-up girl now calling herself Maggie. The murder shocks the town as expected, bringing along crime podcaster/Gale Weathers stand-in/Lisa Loeb look-a-like Piper Shaw, who begins poking around for clues. Elsewhere, Emma tries to build bridges with her estranged friend, the recently-outed Audrey, finds out her boyfriend isn’t all he’s cracked up to be, and attracts the romantic attention of intense new-boy, Kieran, who just happens to be son of the Sheriff, who is dating Maggie. And breathe. For the next couple of episodes, there’s a murder thrown in – teenage girls, natch – and then things dry up for three consecutive episodes, switching to almost Scooby Doo levels of teen mystery solving, punctuated with an occasional phone call from the killer. As Noah points out early on, it’s got more in common with fellow teen-fare Pretty Little Liars (of which, Lucy Hale had a cameo in Scream 4), and too little stab n’ drip. Things slowly ramp up towards the finale, a grisly farm vehicle demise, and scenes reminiscent of the tension from the earlier movies as things hurtle towards the climax. However, in spite of Noah’s insights, people still find reasons to split up, have flimsy excuses for not being around (“I went for a walk down by the lake…”), and play into the killer’s hands at almost every turn. Working out the identity of the loon is no easy task: Everyone has an alibi at some point, and based on three of the four movies, we know there can be more than one killer on call. Once they unmask themselves and spew their very familiar motive, it all wraps up a bit too tidily and conveniently, teasing us with a twist that will doubtlessly be the lead in for the second season. It’s also done and dusted in minutes, whereas the exposition scenes in the movies were gloriously detailed and exciting. Everything crammed into the final episode should have happened over two episodes, especially in a series where there was more than enough time to play with. 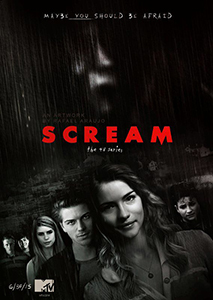 An entertaining enough stack of episodes, but too many to support the needs of the plot, something that the imminent 15-episode order of Scream Queens (starring Emma Roberts!) may also have difficulty with. One might’ve assumed so much extra time would mean longer chase scenes, juicier tension? Nay. It means subplots. Boring, ultimately pointless subplots and way too many survivors. Fitzgerald makes for a functional, sympathetic final girl, and Taylor-Klaus and Karna are great as the ones who do most of the detective work and supply the best insights and dialogue. Will I watch Season 2? Of course, but this is certainly an anemically pale imitation of an essential movie series. Blurbs-of-interest: Bex Taylor-Klaus was later in Hell Fest; Tracy Middendorf was Julie the babysitter in Wes Craven’s New Nightmare; Bobby Campo was the foreseer in The Final Destination. But are you ready for the CW’s upcoming Friday the 13th series? The jury will remain out until it airs. So no Harper’s Island review from you, then? I kinda liked that one! I recall writing little updates when it was airing, but haven’t reviewed it as a whole. It was more satisfying than Scream though.